You’ve probably heard of bitcoin — or should it be capitalized, Bitcoin? — and if you’ve gone further into it you’ve heard of Blockchain, or blockchain. These are words that a lot of people have heard and don’t understand. But bitcoin sounds like money, that’s the only thing everyone knows for sure. OK, here’s how it works. If you buy bitcoins you don’t receive physical coins. What you get is an entry in a ledger kept on the internet, an entry that says you have that many bitcoins and only you can access and spend them. Bitcoin – an internet ledger entry representing the monetary value which the buyer paid in conventional money for the entry – is the brainchild of a person or group of people going by the name Satoshi Nakamoto. Bitcoins became available in January, 2009, and you could have bought one for $2.89. The value of bitcoin rose rapidly over the next eight years and by the end of 2016 buyers were paying around $1,000, an astonishing 300-fold increase! Then the real fun began. In the next twelve months bitcoin soared to about $20,000. Now, you know what’s coming next. Like the tulip bulb mania in 1637, people stopped buying, owners began selling, and the market for Bitcoin fell in a steep jagged plunge. Bitcoin had been designed as a medium of exchange, a global internet currency, but instead it had clearly become an asset, like tulip bulbs, coffee beans or Impressionist paintings, a thing people were buying with the expectation that they could turn around and sell it at a higher price later. Bitcoin had been designed as a currency that would facilitate global trade without the use of middlemen. Conventional currencies work well enough, but to use them in national or global trade means using of banks, and paying banks for their service adds to the cost of doing business. 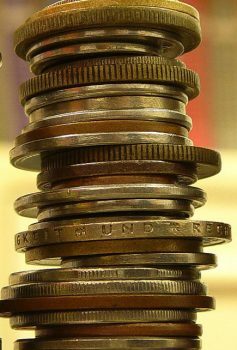 Furthermore, governments can manipulate and in some measure control the flow of currencies, and that can bring unpredictable costs to business, too. What makes, or made, bitcoin so attractive is that it isn’t controlled by anyone. Not only that. Bitcoin transactions are done without banks or governments even seeing what’s going on. The transactions are extremely secure. The system which is used to keep the ledger online, safe and private, is called blockchain. When you purchase bitcoin, that transaction is recorded in the online ledger and the record of that transaction is distributed to other computers in the blockchain network and validated by certain protocols to becomes part of an ongoing chain of transactions. You receive a unique digital “key” that gives only you access the your account. If you forget it or lose the paper on which you wrote it down, there’s no way to recover or regenerate it. Now you can use your bitcoin account to buy something — say a commodity like rice — from a person who sells rice and accepts bitcoin in exchange. By the rules of the blockchain game, the record of your bitcoin disbursement must refer to the earlier record whereby you acquired those bitcoin funds. Your current transaction, paying to purchase something, is gathered into a block with other transactions and that block has a cryptographic reference to a previous block and an encrypted digital “fingerprint.” When it’s completed, the block is sent to the other computers in the network and becomes part of the blockchain. Putting together a block of bitcoin transactions requires a lot of heavy mathematical lifting and an enormous amount of computer time. The end product is a series of blocks of transactions chained together in such a mathematical way as to make them extremely secure from hackers, thieves and governments. Bitcoin and blockchain couldn’t exist until the digital age. Working together the two make a global currency system that has no central bank and no governmental backing. In that fashion it resembles one of the earliest and longest lasting global currencies ever, cowrie shells. A cowrie is a small mussel; something like a little clam with a single shiny decorated shell that’s curled around itself, leaving a small open slit. 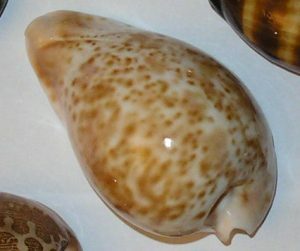 Cowrie shells were used as currency in China beginning three thousand years ago and have been used in different parts of the globe up into the 19th century. They didn’t have computers, that’s all.